Sue in Ocelot's cool and airy cockpit. We eat most of our meals out here. 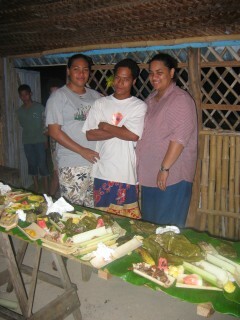 At the end of a Tongan feast. The Tongans we have met are friendly and warm and engage in conversations easily. They are very religious, having been converted to Christianity in the 1800's by zealous missionaries of the Wesleyan (similar to Methodist) faith. Today there are also many Mormons and some Catholics. On Sundays the Tongans attend church and then visit friends and relatives and eat. It is against the law to engage in business or sports, to the point that you don't even see them swimming on Sundays. The acappella singing in the churches, which we can hear from the anchorage (and actually out in some of the outlying anchorages as well, since there is a church in every small village) is gloriously inspiring and fills the air with the harmony of voices raised in praise. Walking through the hilly streets of Neiafu on other days I am struck by the number of people in black. Apparently people stay in mourning for many weeks so there are always people in black. Shoulders and knees must be covered -- so we yachties are pulling out more clothing than we're used to wearing. I am most comfortable in town with a long skirt and a shirt with short sleeves. Some of the yachties have opted to wear either something to cover the knees but not the shoulders, or vice versa, but men must always wear a shirt. Sometimes when it is very hot I also compromise. Tongan women wear heavy dresses or skirts that come to mid-calf, and sometimes a jumper-style top with a T-shirt underneath. Men might be in western clothing with long slacks or else shorts that cover the knees. To dress up, both men and women wear an intricate woven "apron" which wraps all the way around so that it covers the lap and the hips. The ta'ovala is like a mat made of woven pandanas leaves which the women tie around their waists with more intricately woven fibers and the men tie with a single string. The Tongans are not small people to begin with, and this makes them look very imposing! We'll be putting up photos on the Tonga page later! 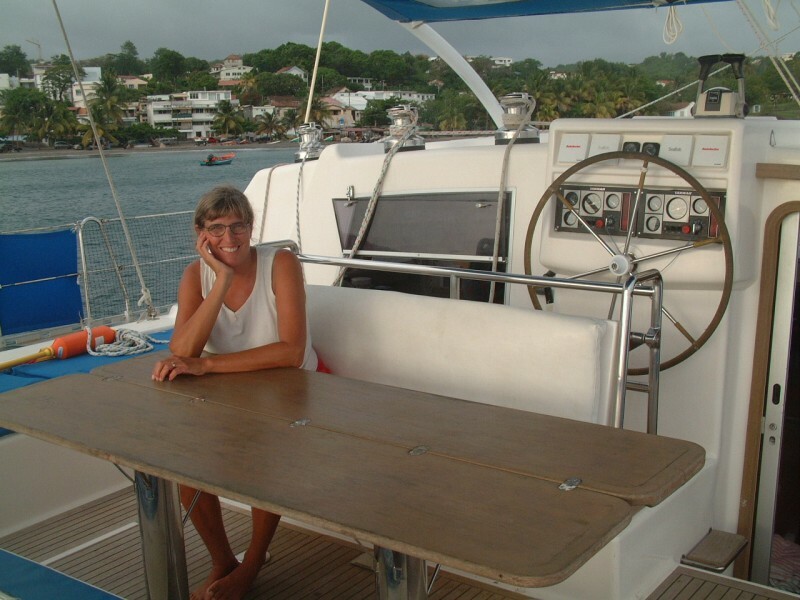 It's Friday mid-day and Jon, Chris and Amanda are off to town with our friends on Lady Starlight. We're both hunkered down in an out-of-the-way anchorage to seek protection from the 25 to 30-knot winds that have been screaming through for a week. This anchorage is near the main island of Vava'u, so there's taxi service to Neiafu and they've all gone in for the races this evening. I have a wonderful day all to myself aboard Ocelot. Just me and the cat. The sun is bright, finally, after several weeks of rain, and the water looks inviting for a snorkel. If I swim I'll be stopping by Lady Starlight to invite their Jack Russell dog, Hinano, to join me. She likes to ride on the shoulders of the snorkeler! I wonder if I could get Arthur interested? Now that we've arrived in Fiji, I look back on the almost five months in Tonga as a really special time in our cruising. We made more friends ashore there than we have anywhere else. Of course it helped that the Tongans speak English...but they are truly friendly people. Well, it used to be called The Friendly Islands!